Josef Gingold was a Russian (Belarusian) violinist, author, and teacher born on October, 28, 1909. He is mostly known for having been a highly successful teacher, one of the artists who put the Indiana University School of Music (Bloomington, Indiana) on the map. Many have put him on the level of Ivan Galamian as an influential violin pedagogue. He began his violin studies as a child (perhaps at age 4) and gave his first public performance for a group of German soldiers during World War I. He was not yet 6 years old and had not yet learned to read music. In October of 1920, his family came to the U.S. and he began his studies at the Music School Settlement in New York City. Later on, from age 12, he studied privately with Vladimir Graffman (father of pianist Gary Graffman), an assistant to the great pedagogue, Leopold Auer. Gingold then made his debut at Aeolian Hall in 1926 when he was 17 years old – one source says 1930, which quite possibly was a second debut. Between May, 1927 and September, 1929, he studied with Eugene Ysaye in Belgium. While there, he gave the premiere of Ysaye’s Ballade – his third sonata for unaccompanied violin (Opus 27, No.3.) – on or about February 28, 1928, at the Brussels Conservatory. Gingold also gave the first U.S. performance of the same work. While in Europe, Gingold concertized for at least a year (in Belgium, France, and Holland) but returned to the U.S. in the fall of 1929. He gave a recital in New York and performed as soloist with the Minneapolis Symphony but things ended there. Additional work was very hard to come by. 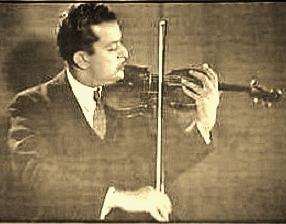 Nevertheless, he played successfully, earning about $85 a week, as a free-lance violinist – for Broadway shows, the Chicago World’s Fair, the Manhattan Symphony, the Ritz-Carlton Hotel and anywhere else he might find employment, even if temporary - until he landed a position in the first violins of the NBC Symphony in 1937. He played there for seven seasons. In those years, several string players who would later reach world-class status as soloists played anywhere they could. Those players included Eugene Ormandy, Pablo Casals, Mischa Elman, Leonard Rose, Joseph Fuchs, Milton Katims, William Primrose, Oscar Shumsky, Israel Baker, Frank Miller, Emanuel Vardi, and Elias Breeskin. Gingold also joined the Primrose Quartet, playing second violin to Oscar Shumsky. He later played first violin in the NBC Quartet. In 1944, Gingold accepted the position of concertmaster with the Detroit Symphony. He was 34 years old. Three years later, he began his tenure as concertmaster of the Cleveland Orchestra, where he remained for 13 years. While in Cleveland, Gingold taught at Case Western Reserve University. In 1960, he took up teaching full-time at Indiana University. He also taught master classes around the world. It has been said that Gingold emphasized individuality in his teaching, in the style of Leopold Auer. He edited many violin works and compiled a 3-volume set of orchestral excerpts which is highly valued by aspiring orchestral violinists. You can hear one of Gingold's audio files on YouTube here. Among his many pupils are Joseph Silverstein, Jaime Laredo, Philippe Graffin, Erez Ofer, Raymond Kobler, Corey Cerovsek, Miriam Fried, Catherine Lange, Anne Akiko-Myers, Eugene Fodor, Arturo Delmoni, Leonidas Kavakos, William Preucil, Philip Setzer, Shony Braun, and Joshua Bell. Josef Gingold died on January 11, 1995, at age 85. His violin, which he obtained in 1946, was the Martinelli Stradivarius of 1683. In 1998, Gingold’s son George (a lawyer) got into a legal fight with a violin dealer over the commission he owed after the dealer sold the violin (for $1.6 million.) The fight was settled out of court. Augustin Hadelich had this violin on loan from 2006 until 2010. I spent a couple of hours listening to the Martinelli Strad up close about three years ago and it does have a wonderful sound.